Soft cover journal with bright blue, leather-like cover and a flexible spine that lays perfectly flat when open. Pages are a high-quality, silky-smooth white paper with rounded corners. Great for use with pens, markers, or dry media. 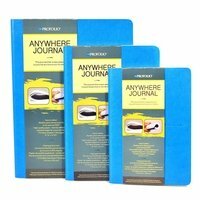 Itoya Profolio Anywhere Journal B5 Large 7.5" x 9.9"
Itoya Profolio Anywhere Journal A5 Medium 5.8" x 8.25"
Itoya Profolio Anywhere Journal B6 Small 4.9" x 7"